We all wear a uniform. No, I’m not talking about a school uniform, or fireman’s get up (unless you are a fireman, in which case you actually wear two uniforms!) I’m talking about that outfit which you always fall back on; the trusted, safe, combination of clothes which you feel most comfortable wearing. It’s okay to have a uniform. After all, on a base level we all want to fit in with society’s norms. The problem comes when this uniform is all you wear. 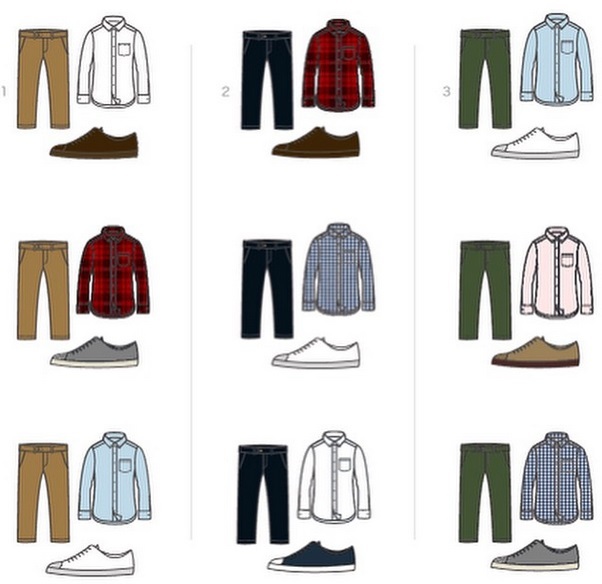 Yes, you may change the colour of the t-shirt sometimes from black to very very very dark grey, but ultimately you’re still wearing jeans, a t-shirt and trainers every day. I’ve fallen into this trap a number of times in my life. In my teens it was tracksuit bottoms and a sports polo (No joke. I was a scally), in my 20s it was the jeans and tee selection, and in my late 20s it was beige chinos, brown brogues and navy polo shirts. It took an off-hand comment from a work colleague for me to realise I had become entirely predictable. We were discussing clothes and he said ‘Yeah, but you basically wear the same stuff most days.’ It wasn’t meant with malice, but it was struck a chord with me. From that point on I decided to broaden my colour palette and educate myself as to what sartorial options were available to me. I read fashion blogs, googled ‘fashion mistakes’ to learn what I should be avoiding and, most importantly, decided to take some risks. The colour combinations above are a good starting point. To a certain extent we’re all risk adverse. We don’t like to open ourselves up to ridicule. And, by god, when you set out on a style journey you’re going to get savagely ridiculed. I’ve lost count of the times I’ve worn a blazer and heard ‘Do you have an interview?’, or a striped top and heard ‘Where’s the boat moored?’ This is to be expected. After all, your friends and colleagues have this one preconceived idea of you, and what you wear, which has been built over a number of years. Any changes to that status quo will be jarring for them. The first time you wear that blazer you’ll be an oddity… but the fourth time you wear a blazer it’ll just be ‘Oh, he wears blazers sometimes’. It becomes the new norm. The trick is to change your wardrobe gradually. I’ll be writing a piece about a ‘capsule wardrobe’ soon – but the basic idea is that there are some pieces which will never go out of style. These are what you should be purchasing to begin with, incorporating them slowly and steadily into your working week. This is also why I started creating outfit grids. There’s nothing like laying out all your clothes on the floor to realise that, hey, I have quite a lot of options available to me! So, yes, I still wear a uniform. The difference is that I have about thirty different uniforms to choose from each day. I’m with you on the experience of wearing the same thing every day. For me, recently its been jeans and a t-shirt. It’s a totally predictable uniform. I’m going to send this article to a friend of mine. Thanks for the info!